- Edmond PetSmart: Third Saturday of every month. 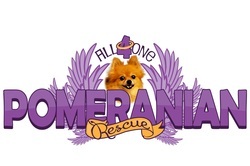 Non profit animal rescue for Pomeranians, Senior Breeds and Cats in Oklahoma. To provide a safe, clean and loving environment for dogs and cats in need until they find a permanent place to call home. We strive to help these animals as long as they are in our care and promote getting homeless animals off the streets and out of kill shelters. Lottie is a cute smaller dog who loves attention from her human. She is a bit of the jealous type with other dogs and would do best as the only dog in the household. As you can see, she gets along with cats. Lottie is a bit of an escape artist so no apartments and a wood stockade fence please. Lottie's adoption fee is $250. She is potty trained and up to date on vaccinations and heartworm medication. She has been spayed. Thank you all for your continued support. If you want to help fight the strike on homeless, neglected, abused, surrendered and naturally displaced animals please don't wait...make a contribution today!